Yesterday I met Frank Sinatra’s band leader. He is in his 40s, Canadian and prone to signing his own book for bemused strangers in random bookstores*. Ok, ok … technically the man I met yesterday — Mike Dover — is not and has never been Frank Sinatra’s band leader. But it is a description he uses to explain how it now feels to step from the shadows of leading think-tank research projects and consulting assignments and into the spotlight as co-author of a new book appearing at an airport bookstore near you. 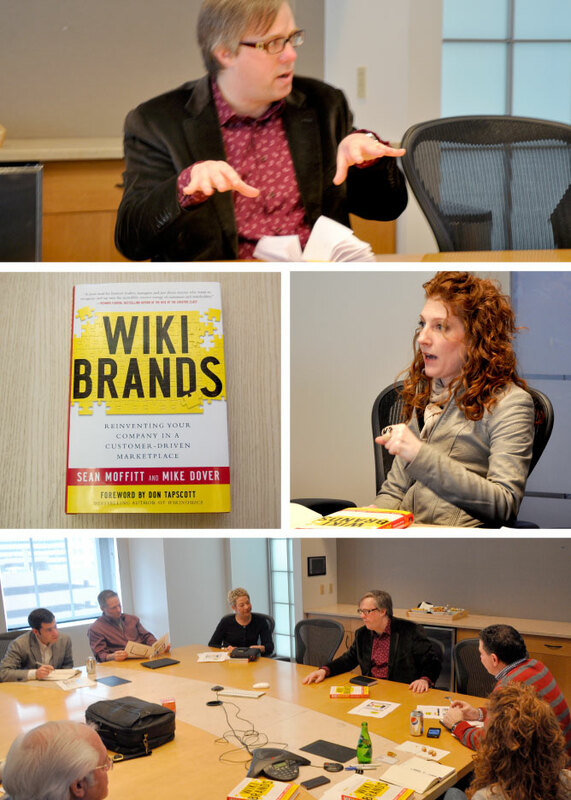 Mike was kind enough to stop by LPK and spend some time talking with us about his book Wikibrands: Reinventing Your Company in a Customer-Driven Marketplace. Co-written by Dover and Sean Moffit, Wikibrands discusses the evolution of branding, a discipline once dependent on mass communication but now increasingly enabled by a culture of social influence. In chatting with our group, Dover made a strong case for brands to embrace collaboration with their customers, who can now effectively ignore traditional advertising and who want to engage with brands that demonstrate authenticity and foster co-creativity. He also shared with us his cheekily titled FLIRT model, which lays out a recipe for wikibrand success and discusses many of the case studies — both the good (IBM, Dell) and bad (United**) — chronicled in the book. The conversation was wide-ranging as we picked Mike’s formidable brain on any number of topics, including the value of compelling social objects, the cultivation of a brand’s community and the concept of brand as cause. A mention of Fiat’s recent participation project Mio led us to a rich discussion of the principles for successful consumer engagement: keep content fresh, weed the garden (i.e., appropriately moderate the participation), define the end point and establish reasonable metrics. Ultimately I was left with the conclusion that a wikibrand world is our new normal. Certainly our clients and the LPK brand have engaged with social media, co-creation and consumer participation on a more frequent basis over the past couple of years. And yet we have only just begun to tap into the true value of users and community. While every brand may not offer the participation opportunities of Facebook or Threadless, a willingness to engage with consumers in ways big and small will become a hallmark of a progressive, modern brand. *Seriously, Dover has done this. He also revealed that his mother has at least 75 copies of his book at home. Were I ever to pull it together enough to write a book, I feel like my mother would fill up my old room (the one that now belongs to the poodles) with cases stacked to the ceiling. So I could relate to this man.